Irish director Sinéad O’Shea has been included as one of ten outstanding European women filmmakers for the third edition of Europe! Voices of Women in Film. A partnership between European Film Promotion (EFP) and the Sydney Film Festival, the initiative presents an exciting range of works from ten emerging female directors to watch. Europe! Voices of Women in Film will be presented in conjunction with Screen International and EFP from 6th – 17th June, where O’Shea’s documentary will be screened alongside titles from nine other filmmakers from around the world. The programme will also discuss the challenges facing women in the film industry, the journey towards inclusivity and parity, and the current state of gender diversity. Filmed over the course of five years, ‘A Mother Brings Her Son To Be Shot’ tells the story of a mother and her two sons facing adversity in post-conflict society in Northern Ireland. One night Majella O'Donnell took her teenage son Philly to be shot in both legs. Majella, Philly and his shooters all live within an extraordinary community in Derry, Northern Ireland. 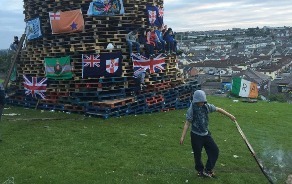 The "Troubles" officially ended in 1998 but this community is still at war. They do not accept the government or police. All this happens within the jurisdiction of the United Kingdom. How do you bring your son to be shot? What happens afterwards? How does family life continue? How does a community respond? When do wars really end? ‘A Mother Brings Her Son to Be Shot’ is produced by Ailish Bracken and Sinead O’Shea for Blinder Films, with co-producer Figs Jackman for Spring Films. Joshua Oppenheimer, André Singer, and Katie Holly served as executive producers and the film was financed by the Irish Film Board. The feature was filmed over the course of five years by Richard Kendrick, Ross McDonnell, Enda O’Dowd, Paddy Stevenson, and Sinéad O’Shea. Sinéad O’Shea is a filmmaker and journalist. She has made films and reports for the BBC, Al Jazeera English, The Guardian, RTE and The Irish Times.